Today we’d like to share our own developer guide to Magento Marketplace. 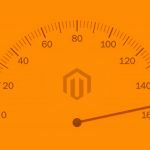 If you are a Magento merchant, check this one – Magento Marketplace Merchant Guide, but if your are going to sell your products through the new platform, you’ve come to the right place. Below, we will describe how to work with the marketplace. The number one thing on Magento Marketplace is Developer Portal, where you can manage all information related to your marketplace account. Besides, you get product submissions and monthly payments there. Since Developer Portal is so important, we’d like to describe its core options. 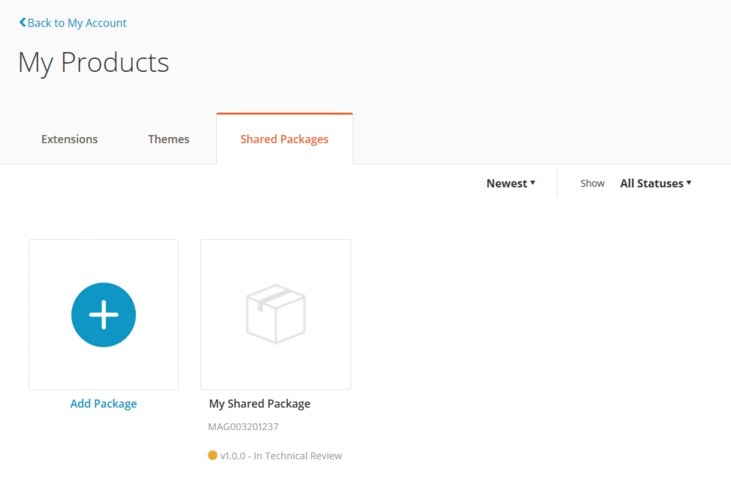 The first section offers a similarly-named option that provides the ability to manage all your products: extensions, themes, and packages, and the My Access Keys option that provides the authorization required to perform certain actions on Magento. 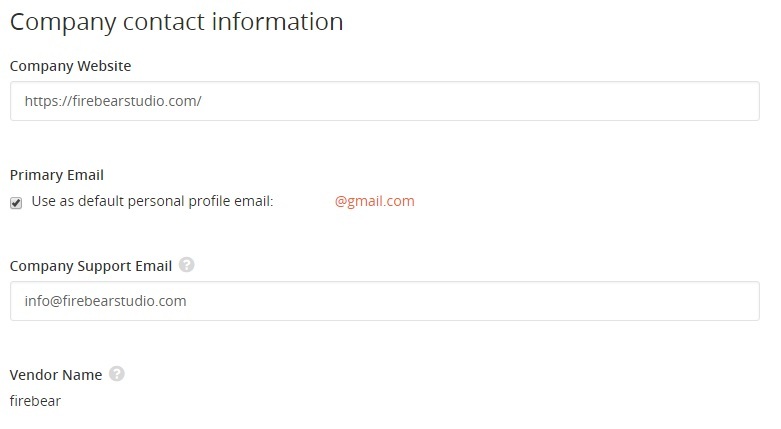 As for the Payment section, it specifies an email address for receiving monthly notifications. In its turn My Information offers an opportunity to identify your company and you as an individual on Magento Marketplace as well as displays some stats related to your sales activity. 1.4.2.1 How to open my product profile? 1) The official Magento Marketplace user guide recommends to take a quick tour through the platform from the perspective of a customer. This trick will help you understand how your potential buyers see your products. As a result, you will be able to represent your Magento extensions and themes in a more user-oriented manner. 2) Then, it is necessary to review policies & requirements of Magento Marketplace. Of course, and will have to agree with them in order to work on the platform. So, if you are going to agree with something, you should understand the agreement. 3) The next vital step requires managing your Marketplace account and credentials. Without performing this actions, you will never leverage benefits of working on Magento Marketplace. 4) Now, when you have a complete account, it is time to learn more about uploading your products to Magento Marketplace and submitting them for review. 5) Managing your sales is also among key steps necessary to become familiar with the platform. Pricing, taxes, revenue sharing, and refunds are described below. 6) The last important step requires checking out the Developer’s Reference with all its links to technical documentation. There are some strict rules related to running a Magento Marketplace account. First of all, a standard Magento account is created if you create a new Marketplace account, but it contains some additional information taken from your Marketplace profiles. Another thing we should mention in our Magento Marketplace Developer Guide that only one person gets the ability to maintain an company account of the whole company on the platform. It is also necessary to add that you should use the same account for all products – extensions and themes – created by your company. Log in (if you already have a Magento account) or register for a new account. 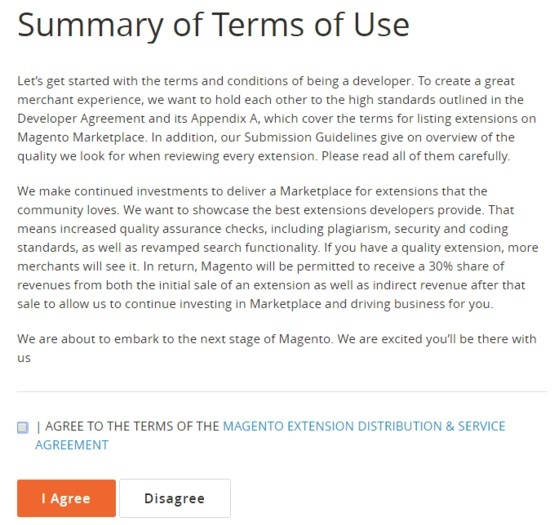 Agree to the Magento Extension Distribution and Service Agreement. Complete your personal profile with the information that will identify you as an individual vendor in Magento Marketplace. Add your background, contacts, and image. 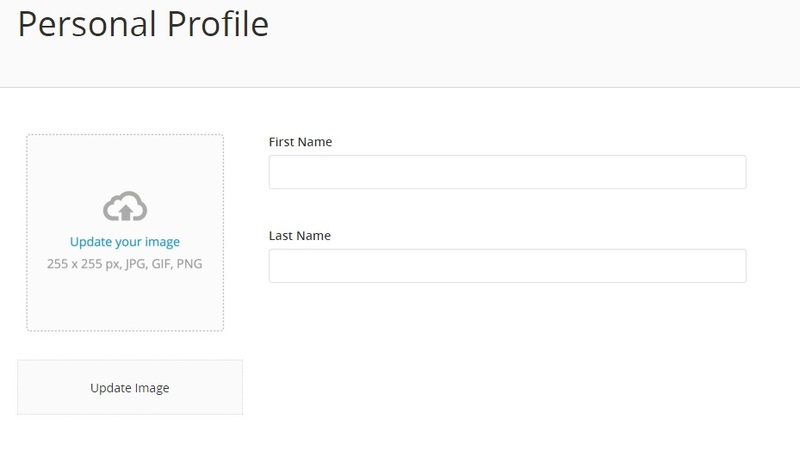 You can also complete a company profile, which is similar to your personal profile, but provides information related to your brand. Complete payment options – add an email address to get monthly notification related to payments. Below, we describe how to set up a Marketplace account in more details. 1. Visit Marketplace Developer Portal and hit the Let’s Get Started button. 2. If you already have an account log in with the help of appropriate email address and password. 3. If you don’t have any, create a new account by tapping the Create an Account button. You will have to enter your personal data, add a description of your company, and choose the Screen Name that must start with a letter and can be up to 15 characters long. The minimum number of characters is 4. Note that you can use numbers and the underscore characters. As for password, it is also necessary to set it at this stage. Requirements for password are: 8-16 characters, not less than one capital letter, one number and one lowercase letter, or special character. You can also activate the Security Updates checkbox during this stage. As a result, Magento will inform you about security alerts. 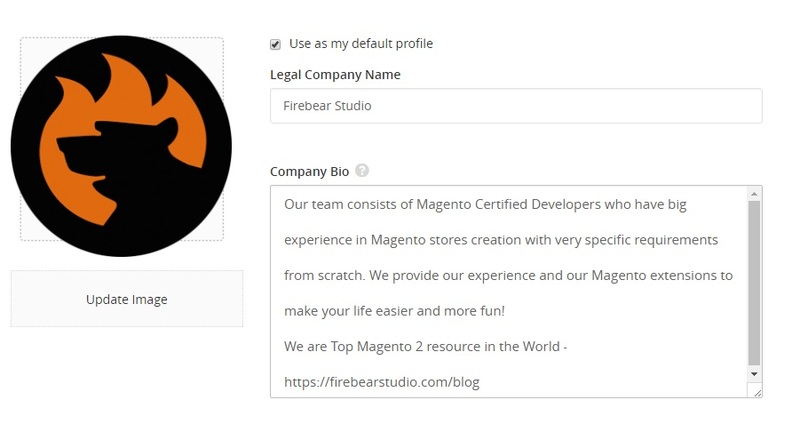 As we’ve already mentioned, your personal profile identifies you as a vendor on Magento Marketplace illustrating your personal information and contacts. To find your Personal Profile, go to your Marketplace Account/My Information and find the Developer Portal tab. An image used for your personal profile should be a 255 pixels square in JPG, GIF, or PNG. You can add it by dragging the image to the box or tapping Update Image. Use your real first and last names. Fill in the Bio box with information about your experience. Note that you can change the height of the box by dragging the lower-right corner. Contact information includes URL of your Personal Website, your Screen Name, email address as well as the location of your office, and Vendor Name – a unique name that identifies your Marketplace account. Note that it must be lowercase alphanumeric characters. Dashes could be included. Vendor Name is extremely important when you submit Magento 2 packages – it should be used in the vendor part of the composer.json file name field. Here, you have to specify your country, street address, phone number and other related data. Although this one is optional, it is highly recommended to add social network profiles that you use. Just leave an appropriate URL. Company Profile is almost similar to Personal Profile. There is a checkbox in this section that makes your company profile as a default profile. As for required data, it is your Legal Company Name and a brief description (the height of the text box can be changed as well). Requirements to an image for your company profile are the same – a 255 pixels square in JPG, GIF, or PNG. You can upload it as described above. The Company Address section includes the official address of your company and its phone number. The section is also optional, but it is highly recommended to add social network profiles related to your company. 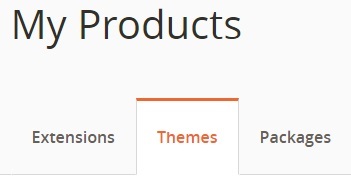 To manage your submissions to Magento Marketplace, go to the Products page of your account. There are tabbed sections showing a status of each submitted product type (extensions, themes, shared packages) and providing access to additional information and options. To submit a package with a theme or an extension to Magento Marketplace, you should upload its zipped archive. In case your extension utilizes separate components, you should also submit each component as shared packages. After you’ve submitted a package, it is placed in a queue for technical review. Magento Marketplace sends confirmation to your email. If you are wondering about the progress and status of the review, this data is available in your Marketplace account. 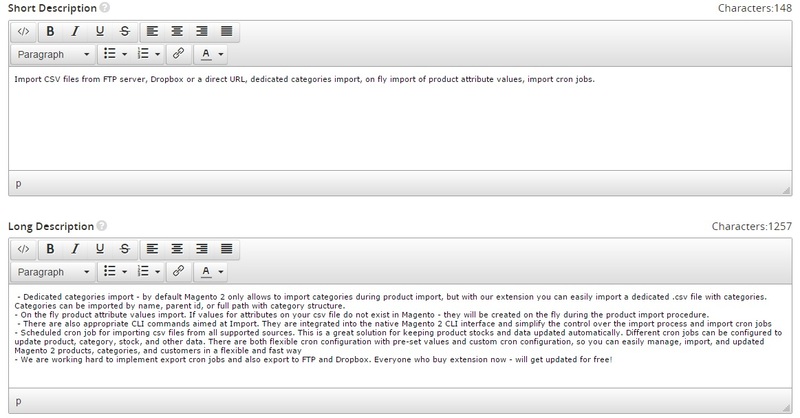 Perform the following actions to submit a package to Magento Marketplace. We describe how to do this on the example of extensions, but the same logics should be applied to themes. 1. Go to your Marketplace account and My Products page. Here, you should choose a type of your package. There are three tabs available: Extensions, Themes, and Shared Packages. 2. As mentioned above, we describe how to add a package with an extension, so tap Add Extension. 5. You will be prompted to add more information and upload your package to Magento Marketplace. 6. Choose the extension Title. Note that it will be used on Magento Marketplace and to edit it later, you will have to resubmit the whole package. 7. Specify the Public Version Number. 1.0.1; 2.5.4; 1.6.5, etc. 8. Drag a zip file of a package to the box or browse it to upload the extension to Magento Marketplace. After the upload, you will the the extension’s name below the box. 9. In case your extension uses other packages, tap Choose existing shared packages and mark the checkbox of each shared package required by your module. And don’t forgt about release notes. 10. Now, you can tap Submit and then Continue to go to your product profile or click Go to My Products to visit the product page of your Magento Marketplace account once again. A product profile has a dramatic importance due to several reasons. 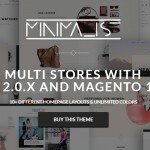 First of all, it shows a current status of the extension or theme as well as provides the content that appears in the appropriate listing of Magento Marketplace. It is also necessary to mention that your product profile includes fields that must be complete before submitting a product for Marketing Review. How to open my product profile? 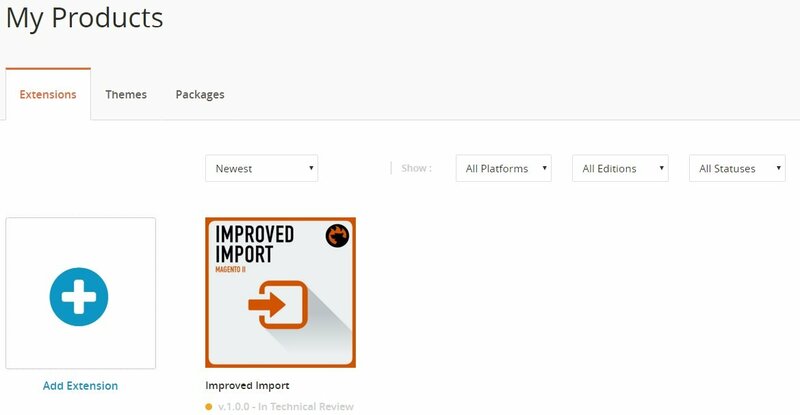 After you’ve submitted your package, your product profile should be opened automatically. Otherwise, go to the Marketplace tab of your account and choose My Products. On the Extensions (Theme) tab, tap an appropriate extension (theme) to open the profile. You will get a form where certain data has been generated automatically and cannot be changed. Note that the aforementioned form can be saved as a draft, but only a complete form lets you make your submission to Marketing Review. The appropriate button appears only when all required fields are filled in. 1. Describe your product in a few sentences in the Short Description field. 2. Leave a detailed description in the Long Description field (up to 10,000 characters). 3. 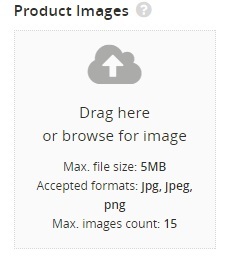 Upload Product Images by either dragging images to the box or browsing to them You can upload up to fifteen images. 4. You can also add up to 2 YouTube videos if applicable. 5. Choose appropriate categories (described below) where the extension listing appears. It is possible to choose up to three categories. 6. 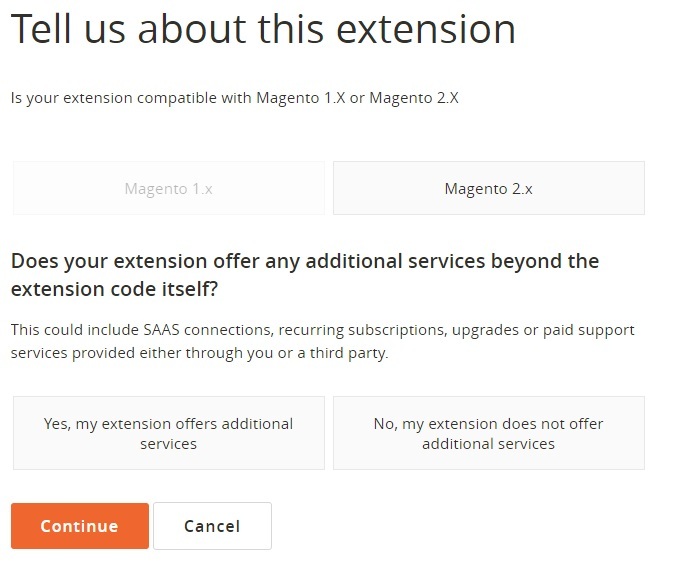 Now, you have to specify Magento editions and versions supported by your product. 7. Specify supported browsers and their supported versions. 8. Upload product documentation. 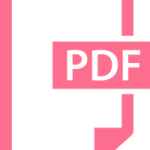 It can be one PDF file (up to 5 MB) for each of the following categories: User Guide, Installation Guide, Reference Manual. 9. Choose at least one programming language utilized by the extension. 10. Choose the License Type. Note that you will require your buyers to agree to it. 11. Specify the Stability setting: beta or stable build. 12. Don’t miss Additional Details. Mark checkboxes related to items that applies to your product. 13. Enter the release notes related to a current version of your extension (up to 10,000 characters). 14. Specify the price ($) of each version of your product from $0.99 to $999,999.00. 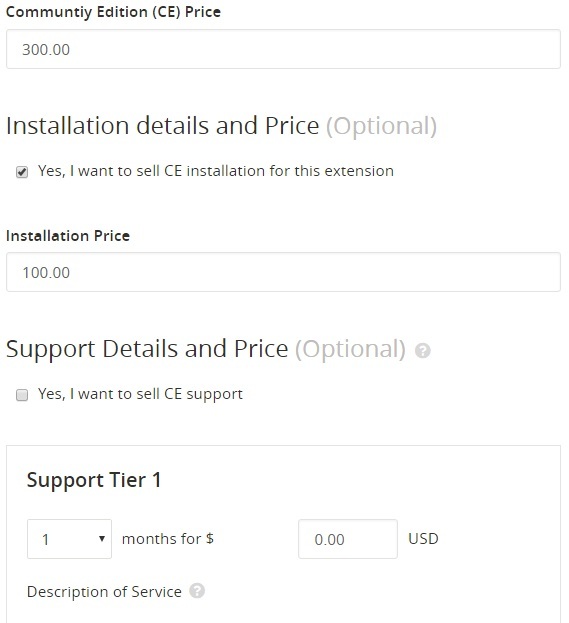 Complete both the Installation Details and Price and the Support Details and Price with tier pricing if your product requires. To implement more advanced customizations to your texts, there is Text Editor among available features. It can be used for formating long text fields. Note that there is a robust toolbar that offers six heading levels, various character formats, hyperlinks management, and horizontal rules editing. The upper-right corner shows a number of remaining characters. Use only high quality images, since they represent your brand and products. 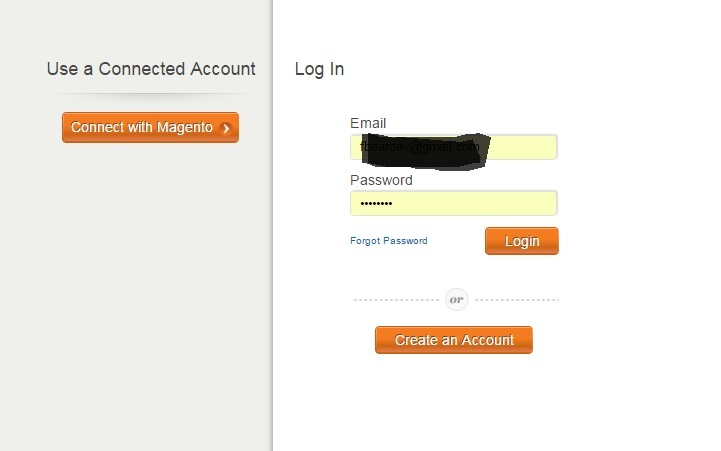 If you don’t have any images uploaded, the Magento logo is used instead. Note that there is a maximum number of images you can upload to a profile of each extension. The limit is set to 15 pictures, so it is highly recommended to use a combination of admin and storefront screenshots. Besides, you can upload images that describe the functionality of your product. 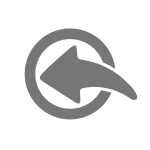 The main extension or theme image should be upload first. To change the existing order, you should reupload images in the correct sequence. Acceptable formats are: PNG, JPG, and GIF. The maximum possible image size is 5 MB. As we’ve mentioned above, it is possible to choose not more that three categories for each extension listing. 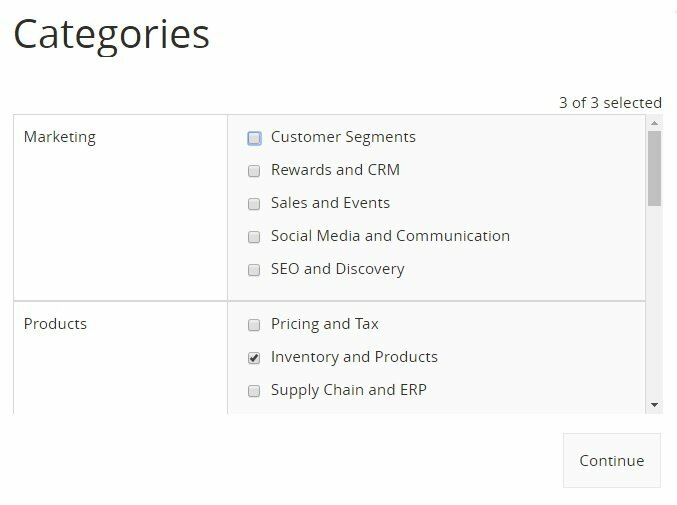 Selected categories determine where your module appears on Magento Marketplace, so you can make it easier to find. All available categories are listed here: Extension Categories. 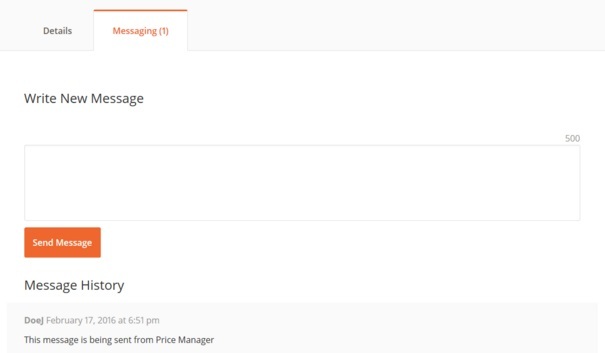 If you want to get support regarding your products, use the Messaging tab. All extension components used by other extensions are called shared packages. In substance, these are zipped archives with a valid code ready for technical review. Since they are not standalone products, there is no need for marketing review. To find out the status of each uploaded component package, go to the Shared Packages tab. 2. Name your package (maximum 50 characters). Use the same name you’ve used in the list of available components. 3. 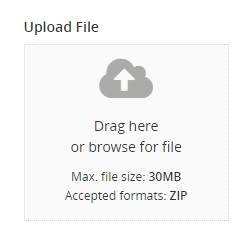 Drag the zip folder to the box to upload your package. Alternatively, you can browse to it. 4. Fill in the Short Description field, describing the purpose of the component in 2000 characters. 6. Choose the License Type. The package will be reviewed, and you will receive an email notification with results. If you are not familiar with what the access keys are, here is a short description: a pair of public and private tokens that are 32-character long are called access keys. They are used for providing authenticated access to the repository that contains third-party Magento 2 extensions and themes. It is possible to create several sets of access keys for other people. Furthermore, the Marketplace access keys can be regenerated, deleted, or disabled/enabled. 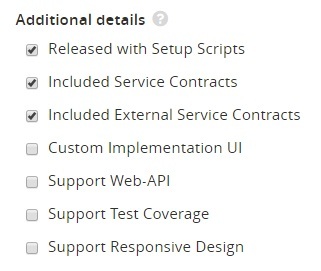 All options are available from your Marketplace account under Developer Portal / Products. Just choose Magento 2 Access Keys and enter a Name to identify the correct set. Note that the access key and the Encryption Key are not the same. 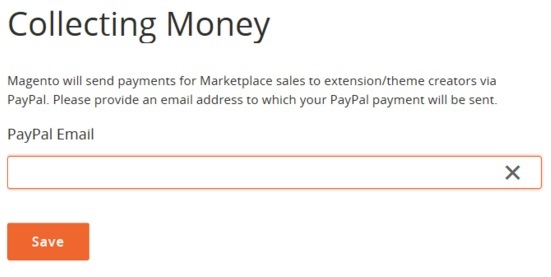 First of all, we should mention that Magento Marketplace utilizes PayPal to process all transactions. All payments are sent on a monthly basis straight to your PayPal account. To find all available payment options, visit your Marketplace account, go to the Developer Portal tab, and tap Payment. To manage your payment options, click Manage Payment Options. Now, you can enter an email address associated with your PayPal account. Don’t forget to save the changes. In our post about Magento Marketplace, we’ve already mentioned that all sales become a subject to a 70/30 revenue share split. As a developer, you get 70% of the revenue. The model is valid for paid extensions, SaaS, or subscription-based products. Note that there is a possibility you will get less than 70%, because some amount may be charged by the U.S. government IRS. As for refunds, Magento Marketplace provides buyers with the ability to get their money back within twenty-five days after the purchase. All refund requests are reviewed by Magento Marketplace administrators.